Ta-daaaa. 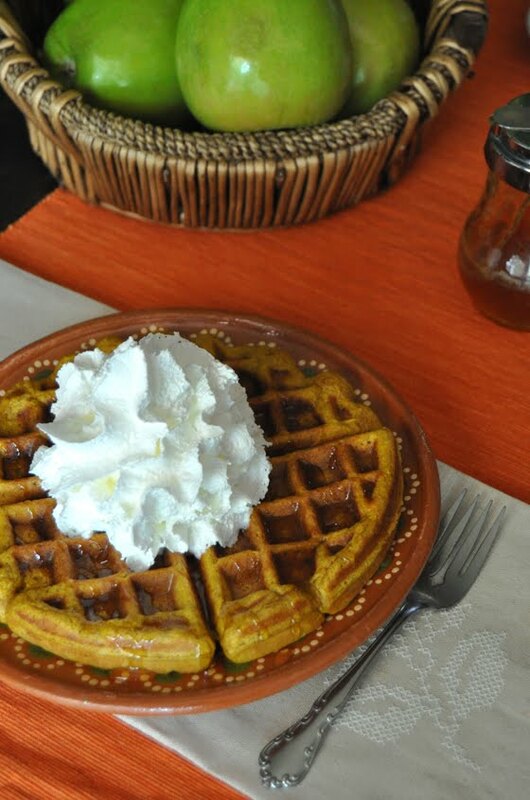 My first pumpkin post this year, hopefully one of many - pumpkin waffles. I saw these on Pinterest and decided that it had to be our breakfast this past weekend. They are really yummy and were my first waffles ever. Ever. I got a waffle machine on Friday and it happened. 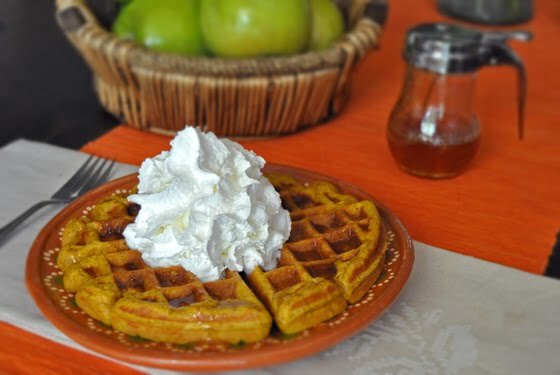 How appropriate that my first waffles were with pumpkin!! It also just happens to be that Fall is my favorite time of the year, I love it, I wait for it from around end of June. I actually somehow enjoy that first really warm month, but I get sick of it really soon so I dream of Fall. Pumpkins, leaves, all the gorgeous colors, warm clothes and blankets, hot cocoa and apples, pears, and all the awesomeness of comfort cooking. I can honestly say that I am in love with Fall. Spray waffle iron with non-stick cooking spray and heat to desired temperature. Combine brown sugar and cornstarch in a large bowl. Whisk together to break apart the cornstarch. Add the remaining dry ingredients and whisk to blend. Separate the eggs. Add the pumpkin and milk to the egg yolks; whisk to blend well. Add the melted butter; whisk to blend and set aside. Whip the egg whites with a hand mixer on high until stiff peaks form, 1-1 1/2 minutes. Set aside. Add the pumpkin mixture to the dry ingredients and mix them together until just combined. Gently fold in the egg whites until blended. Pour the batter on the heated waffle iron and cook to perfection! Note: You can freeze leftover waffles and then pop them in the toaster later. Original post served them with Cinnamon Cream Syrup, which sounds delicious, but I just got a bottle of really nice butter pecan maple syrup and was dying to pour it over this, it was really yummy! Od domacih bundeva ce biti jos bolje!